Francis Bacon (28 October 1909 – 28 April 1992 in Dublin, Ireland) was an Anglo-Irish figurative painter known for his bold, austere, graphic and emotionally raw imagery. Bacon's painterly but abstract figures typically appear isolated in glass or steel geometrical cages set against flat, nondescript backgrounds. It is believed that his father was a direct descendant of Sir Nicholas Bacon, the elder half-brother of Sir Francis Bacon, the Elizabethan statesman, philosopher and essayist. 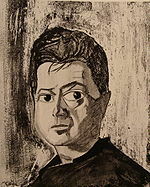 In the 1960s, British painter Francis Bacon (1909-1992) surprises a burglar and invites him to share his bed. The burglar, a working class man named George Dyer, 30 years Bacon's junior, accepts. Bacon paints, talks with wit, and, as Dyer spins out of control, begins to find him tiresome. Could Bacon care less? The film draws heavily on the authorised biography of Bacon, The Gilded Gutter Life of Francis Bacon by Daniel Farson, and is dedicated to him. Part of The South Bank Show series, David Hinton directs this BBC documentary about British painter Francis Bacon, known for his horrifying portraits of humanity. The program consists of a series of conversations between Bacon and interviewer Melvyn Bragg, starting with commentary during a side-show presentation at the Tate Gallery in London. Later in the evening, Bacon is followed through various bars hanging out, drinking, and gambling. In another segment, Bacon provides a tour of his painting studio and a glimpse at his reference photographs of distorted humans. The artist discusses his theories, influences, and obsessions. This title won an International Emmy Award in 1985. See the Art page here.